IPMPLus from Vigyanlabs provides you an Enterprise Software Platform to measure and enable energy savings in your IT infrastructure. 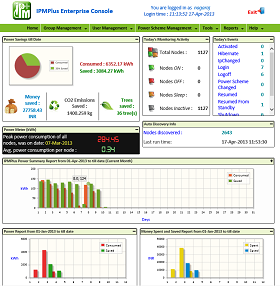 With its powerful built-in Energy Metering software (SoftEM), IPMPLus allows you to measure the actual end-point energy consumption in IT infrastructure with a high degree of accuracy and correlate it to actual IT performance in terms of utilization metrics. Combined with our interfaces to leading Enterprise Uninterruptible Power Systems(“UPS”),you can get real-time information about actual IT infrastructure energy consumption. Working seamlessly across Windows and Linux operating systems on PCs, Servers and peripherals,IPMPlus delivers enterprise-grade IT Energy Reporting. IPMPlus technology enables fine-grained,non-intrusive,distributed IT infrastructure power management. 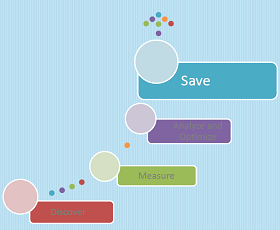 IPMPlus senses”applications” and optimizes power according to needs of each application. By intelligently managing power in components, IPMPlus helps you save energy even when you are using computers.With its ability to discover and group systems, IPMPlus allows Enterprise-wide Power Scheme Management and applying customized policies for different groups.This helps you cascade Green IT targets to business functions across locations. IPMPlus is very easy to install and manage. It doesn’t require any software or hardware upgrades and works with a very small application footprint in the devices it is managing. What’s more-it is architected to scales upto 100,000+ nodes with its distributed architecture.